This is a guest post from Lauren Algee, LC Labs Senior Innovation Specialist. Connect with Lauren and her fellow crowd.loc.gov Community Managers Elaine Kamlley and Victoria Van Hyning via History Hub and on Twitter, as well as GitHub. What yet-unwritten stories lie within the pages of Clara Barton’s diaries, writings of Civil Rights pioneer Mary Church Terrell, or letters written to Abraham Lincoln? 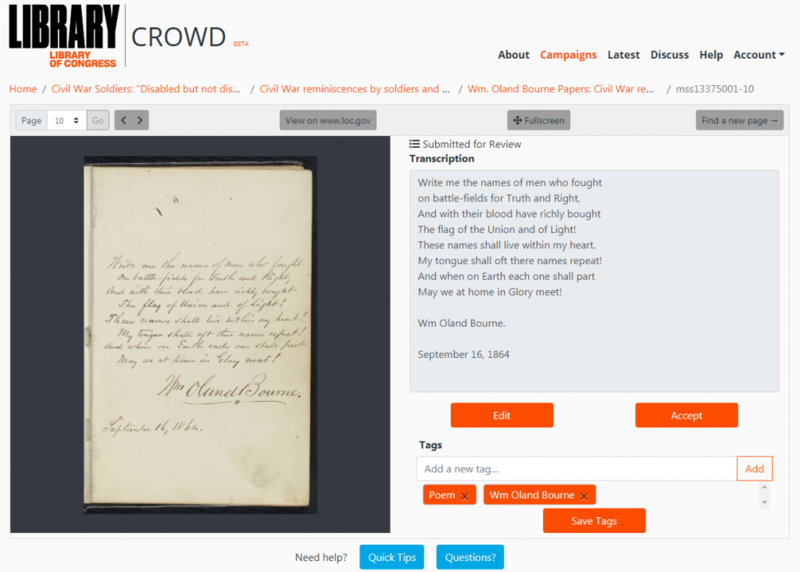 With today’s launch of crowd.loc.gov, the Library of Congress is harnessing the power of the public to make these collection items more accessible to everyone. You are invited to join the Library of Congress via crowd.loc.gov to volunteer to transcribe (type) and tag digitized images of text materials from the Library’s collections. People who join us will journey through history first-hand and help the Library while gaining new skills – like learning how to analyze primary sources and read cursive. Finalized transcripts will be made available on the Library’s website, improving access to handwritten and typed documents that computers cannot accurately translate without human intervention. The enhanced access will occur through better readability and keyword searching of documents and through greater compatibility with accessibility technologies, such as screen readers used by people with low vision. The pages awaiting transcription in Campaigns on crowd.loc.gov represent the diversity of the Library’s treasures. Today, volunteers can choose to work on selections from the papers of Mary Church Terrell, letters the public wrote to Abraham Lincoln, Clara Barton’s diaries, Branch Rickey’s baseball scouting reports, or memoirs of disabled Civil War veterans. We’ll continuously add new materials. Coming soon are documents related to women’s suffrage, American poetry, the history of psychiatry, and more. So how does it work? We import digitized items into the platform from loc.gov using our JSON API. Volunteers type what they see in an image, check transcripts created by others and tag images. All of these tasks will help enhance existing collections metadata. We expect to release the first set of publicly-transcribed materials in early 2019. Participatory projects like these are known as crowdsourcing, meaning that they invite the public – nonspecialists and specialists alike – to engage with collections and process information. This is not the Library’s first foray into these approaches. We have long invested in building digitized collections and making them searchable. One of our first attempt to recruit volunteers to increase their findability began in 2008 when the Library’s Prints and Photographs Division published thousands of photographs on Flickr Commons. For over 10 years, this project has invited visitors to the photo-sharing social network site to help identify people and places in the photographs, generating additional rich information about them. Two additional crowdsourcing efforts within the Library – American Archive of Public Broadcasting’s FixIt+ and Library of Congress Labs’ Beyond Words – invited people to transcribe historic public broadcasting programs and to identify cartoons and photographs in the Library’s historic newspaper collections. These projects have demonstrated the passion of volunteers for the Library’s mission and programs, as well as the knowledge and expertise the public has to share with the Library. Crowd.loc.gov runs on an open-source software, Concordia, developed utilizing the user-centered design principles of trust and approachability. It has been open source from the beginning and is available in the library’s Github repository. 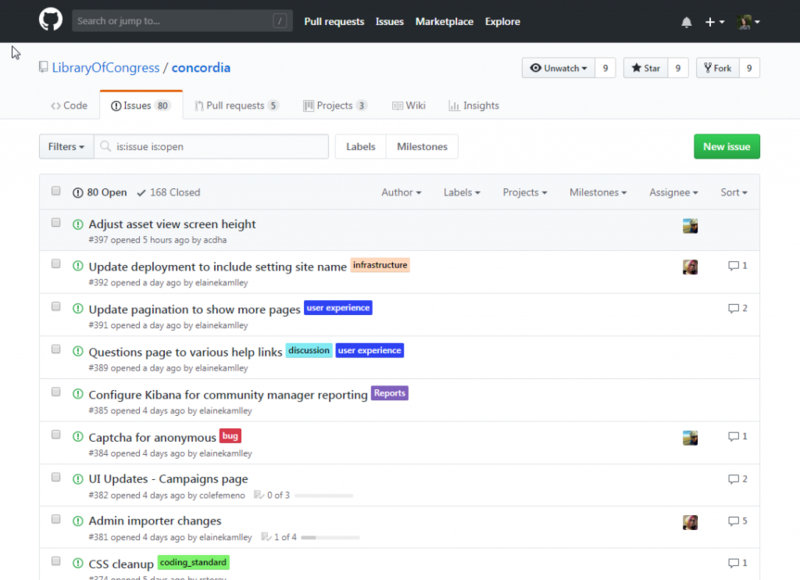 Because Concordia is open source, other libraries and organizations can use the code to create transcription projects focused on their own collections. Have we got you curious? Good! Consider visiting crowd.loc.gov today to contribute to our Abraham Lincoln Papers Challenge. We hope to inspire volunteers to finish transcribing over 10,000 items from the papers by the end of 2018. Help us meet our goal by transcribing at least one page; then share your work with others in History Hub! This is a syndicated post. Read the original at The Signal 2018-10-24.